With the 2014 midterm election in the rearview mirror, the attention of pundits and political prognosticators has quickly shifted to the outlook for the 2016 presidential election. On the Democratic side, former Secretary of State, First Lady, and U.S. Sen. Hillary Clinton appears to be the prohibitive favorite to emerge as the nominee. On the Republican side, however, there is no clear frontrunner, and early maneuvering by prospective candidates has intensified with the announcement by former Florida Gov. Jeb Bush that he is seriously considering a run for the White House. In addition to Bush, several prominent current and former Republican officeholders have already signaled their interest in running, including 2012 Republican nominee Mitt Romney, former Arkansas Gov. Mike Huckabee, former Texas Gov. Rick Perry, Wisconsin Gov. Scott Walker, Texas Sen. Ted Cruz, and Kentucky Sen. Rand Paul. While the identities of the 2016 Democratic and Republican candidates will not be known for more than a year, one thing that is already known is that there will not be an incumbent in the race because President Barack Obama will be completing his second term in the White House. Even though he will not be on the ballot, however, evidence from past open-seat presidential contests indicates that the public’s evaluation of Obama’s performance in office will have a substantial impact on the outcome of the election. 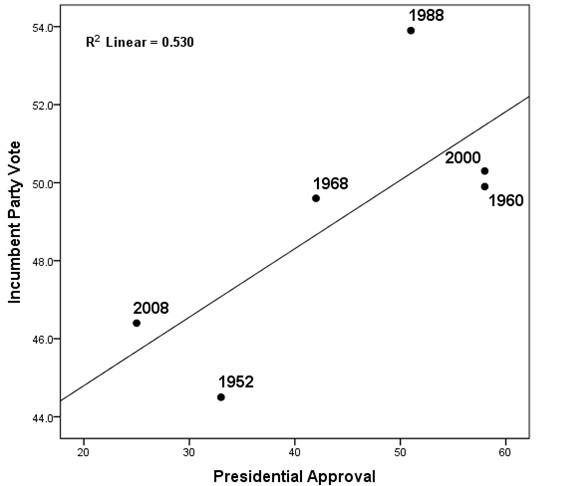 Figure 1 displays the relationship between the incumbent president’s approval rating in the final Gallup Poll before the election and the share of the major-party vote won by the candidate of the president’s party in the six open-seat elections since World War II: 1952, 1960, 1968, 1988, 2000, and 2008. The line shown on this graph is the regression line for predicting the incumbent party vote share from the incumbent president’s approval rating. Despite the small number of open-seat elections, a clear pattern emerges from the data: The fate of the incumbent party’s candidate is strongly influenced by the popularity of the outgoing president. In fact, the incumbent president’s approval rating explains over half of the variance in the vote share of his party’s nominee. All three candidates seeking to succeed presidents with approval ratings below 50% were defeated, and the two seeking to succeed presidents with approval ratings below 40% were decisively defeated. In contrast, two of the three candidates seeking to succeed presidents with approval ratings above 50% won the popular vote, although one of those candidates, Al Gore in 2000, ended up losing the electoral vote. The data in Figure 1 indicate that while the incumbent president’s approval rating has a clear influence on the outcomes of open-seat presidential elections, the results are also influenced by the candidates and their campaigns. These factors almost certainly explain why the points for the 1952 and 1988 elections are far below and far above the regression line respectively. In 1952, Democratic nominee Adlai Stevenson was handicapped not only by a Democratic president, Harry Truman, with a 33% approval rating, but a Republican opponent, Dwight Eisenhower, who was a national hero after serving as Supreme Allied Commander in Europe during World War II. In contrast, the Republican nominee in 1988, Vice President George H.W. Bush, was aided not only by President Reagan’s 51% approval rating but by a Democratic opponent, Massachusetts Gov. Michael Dukakis, who ran what many political observers consider one of the most inept campaigns in modern presidential history. While the outcome of the 2016 presidential election will depend on the popularity of the Democratic and Republican candidates and the quality of their campaigns, evidence from recent open seat elections indicates that the public’s evaluation of Obama’s performance will also have a substantial influence on the results. From that standpoint, the president’s rising approval rating in recent polls is good news for Hillary Clinton or whomever the Democratic Party eventually chooses as its nominee. In the three most recent weekly averages of the Gallup daily tracking poll, the president’s approval rating has stood at 46%. This represents an increase of about three points from his average approval rating over the previous several months. Other recent national polls have found a similar increase in Obama’s popularity, most likely reflecting improving economic conditions. The data in Table 1 show that based on the results of the six open-seat presidential elections since World War II, an increase of three points in the incumbent’s approval rating can be expected to increase his party’s vote share by about half a percentage point. The data in Table 1 suggest that barring a dramatic change in President Obama’s approval rating in the next two years, the outcome of the 2016 presidential election is likely to be very close. 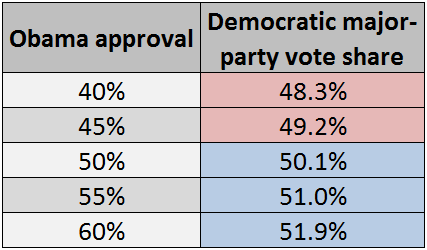 If the president’s approval rating remains below 50% in the fall of 2016, the Republican nominee should be a slight favorite; if the president’s approval rating is above 50% by the fall of 2016, the Democratic nominee should be a slight favorite. However, the results of recent open-seat races also indicate that candidates and campaigns matter: The prediction of a close election could be upset if either party nominates an unusually appealing or unappealing candidate or runs an exceptionally effective or inept campaign.